I was caught on the hop the other night. We were supposed to be going out and our plans fell through so I had to pull together a meal from what I had in. The result was amazing. In the past I have made off the cuff meals from scratch. I suppose it is a bit like the invention test in Masterchef. We have had some great meals but I would not write down what I did so they were always a one-off, much to my husbands dismay. This was one of the reasons my grandson, Danny, talked me into doing a blog. Well, this is my latest attempt at an invention test. Hope you like it. Heat the oil in a large frying pan then fry the bacon over a high heat for a couple of minutes until changing colour. Turn down the heat to low – medium and add the onion and garlic. Mix well and sauté for about 10 minutes until the onion is soft but not coloured. Add the courgettes, mix well and cook for 3 minutes. Add the chicken and cook for 4 minutes then add the tomatoes. Season to taste then mix well. Cook for about 5 minutes until the tomatoes have broken down, the chicken is cooked through and the courgettes are tender. In the meantime, cook the spaghetti as per packet instructions. 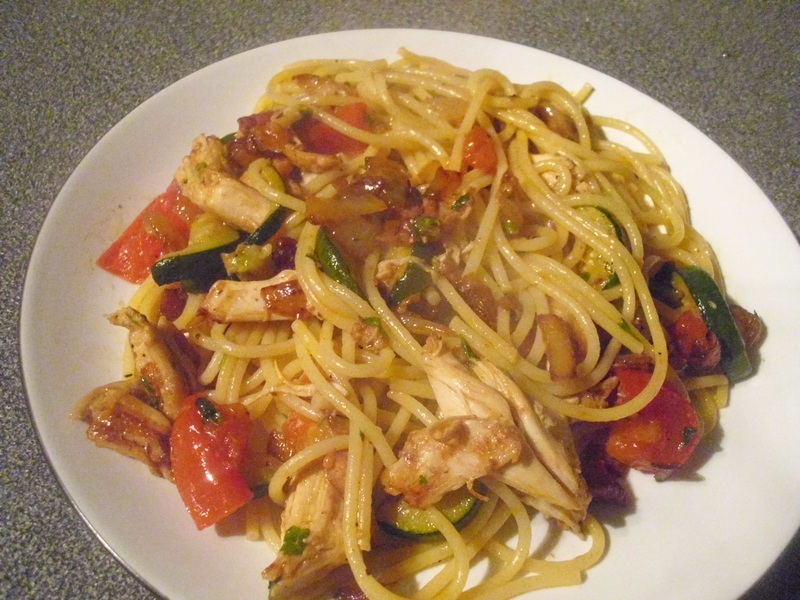 Add a couple of tbsp of the spaghetti cooking water to the chicken mix to make a little sauce. When the spaghetti is cooked, drain and add to the chicken. Toss so the spaghetti is coated with the sauce then serve immediately. 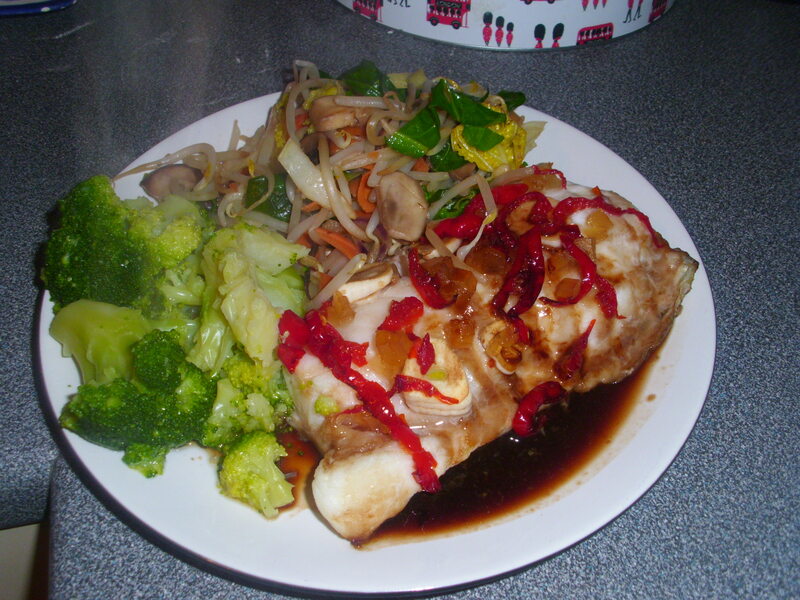 Baked cod with chilli and ginger – delicious! I love fish but wanted something different that would fit in with my Slimming World eating plan. This was exactly that! I can honestly say that every mouthful was delicious. I served it with steamed broccoli and stir fried vegetables for added texture, although a side of boiled rice or noodles with the broccoli would be just as nice I’m sure. The recipe calls for Piquant Peppers (Peppadew) from a jar. These are round in shape, similar to Scotch Bonnets, but there the similarity ends. They are relatively mild although you will detect a slight heat which is enhanced by the sweetness of the chopped stem ginger. Peppadew is the brand name of sweet piquanté peppers, grown in the Limpopo province of South Africa. This type of piquante pepper was first discovered in early 1993 and introduced to market later that same decade.The flavour of the Peppadew fruit is sweet, with mild heat of around 1,177 on the Scoville scale. To put this into context Jalapeños have 2,500–10,000 Scoville heat units. Place the fish in an ovenproof dish. Scatter the garlic, chilli and stem ginger over the top. Mix together the soy sauce and ginger syrup and pour over the fish. Bake in the oven for 10 – 15 minutes or until the fish is cooked through. I wonder how many people buy a joint of beef that looks the business then find its tough and chewy when cooked. That is exactly what happened to me this Sunday. I know butchers say there is no way of knowing if beef is going to be tough before it’s cooked but it is such a disappointment on the day. Thankfully there was only the two of us for lunch and I was able to rescue it by slicing, cutting out the layer of grizzle and braising it with sliced onions in stock for half an hour before serving. That left me with the problem of what to do with the other half of the joint. Those that know me will know I never waste food. I think of all those poor people who have nothing to eat and I just can’t do it! So, given the braising success, I decided to make a Beef Hotpot. It was a huge success, even if I do say so myself. I think the secret of a good Hotpot is to make a really tasty gravy. The meat in this one is already cooked so will not be adding to the flavour so the recipe includes additions that overcome that. Some will turn their noses up at kidneys. Please don’t. Even if the thought of kidneys is abhorrent you will really not know they are in there and they add a lovely richness to the gravy. I have made this as healthy as possible. It’s low fat and, for those on Slimming World, it is very low in Syns, 1 Syn between four people plus any you may add with Spray oil. Here is the recipe. Serve with green vegetables if liked. Spray a large nonstick frying pan with oil and fry the onion over a medium heat for 5 minutes. Add the kidneys and fry for a minute more. pour in the stock and add the cornflour, thyme and Worcestershire Sauce. Season. Add the beef, mix well, cover and simmer for 10 minutes. Pour all the beef mixture into an ovenproof dish. Cover with the potatoes then press the potatoes down slightly so they are covered with a little gravy. Cover with foil and cook in the oven for 1.5 hours or until the potatoes are tender. Serve while hot. Since my last post I have been voted Slimming World Woman of the Year for my group. I am completely overwhelmed and humbled that someone would even think of nominating me. As I stood at the front of group with five other amazing nominees it gave me time to take stock and reflect on my slimming journey and the lovely friends I have shared it with. Some of my closest friends will know I have had a lifelong battle with my weight. I weighed in at 9.5 lbs at birth and it was all downhill from there. I think my Father insisting I clear my plate before I could leave the table didn’t help any or that my wonderful, loyal husband flatly denying for forty-three years that my bum looked big in clothes when I asked, bless him. 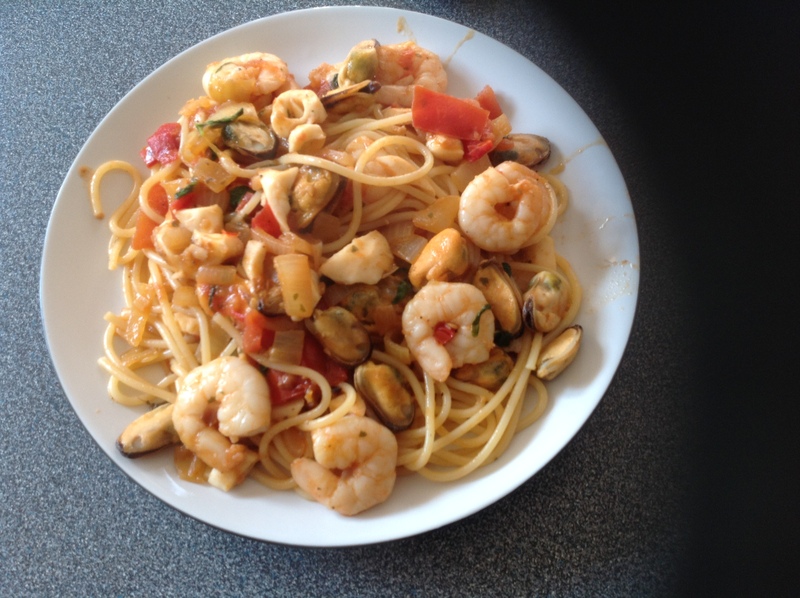 As you may have gathered, I love cooking but it wasn’t until I started following Slimming World that I realised just how much fat my food hero chefs used in their recipes. It has been a challenge to adapt those recipes and, to my absolute amazement, the finished dishes are delicious and much healthier. I admit I am not over keen on the low-calorie spray that is recommended to replace oil and it isn’t always successful for frying some foods, so I often use a normal oil spray but limit the number of sprays and count the Syns. When a recipe is for a few people the individual Syns are negligible so as long as they are counted into my daily allowance it isn’t a problem. Another great love of mine are cooking gadgets. I have recently invested in a slow cooker and could not wait to try it out. This is my first recipe using it. The curry was bubbling gently away all day and was ready for when I returned from my Group meeting. The house smelled divine and the curry was delicious so a great success. Here is the recipe. 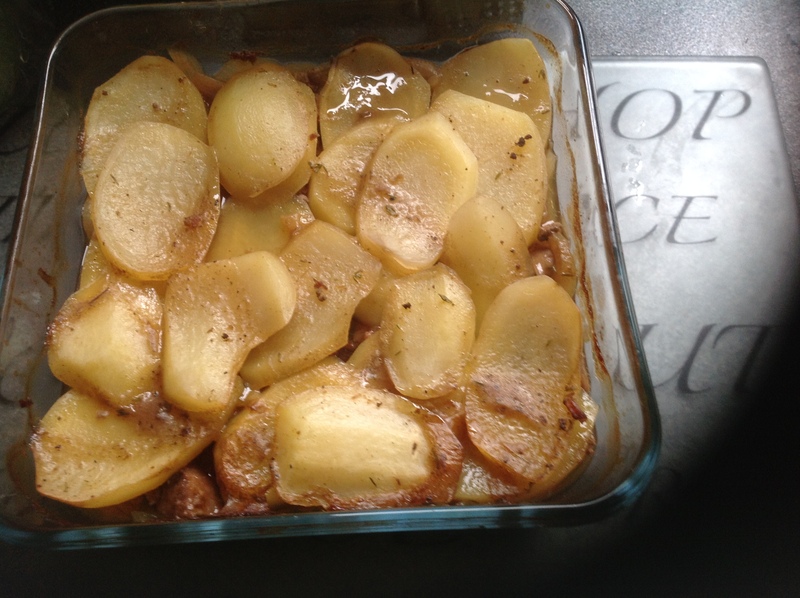 It was adapted from a recipe on BBC Food so that it is Slimming World friendly. By my calculations this works out about two Syns for the whole recipe so only half a Syn if used for four people. Spray a nonstick frying pan with the oil or Frylight and fry the beef in batches over a medium to high heat until browned all over. This will take about 4 minutes for each pan. The aim is to sear the meat so don’t overfill the pan. Transfer to the slow-cooker. Spray the pan again, lower the heat and fry the onions for about 5 minutes until they have softened slightly. Add the chillies, garlic and ginger and fry for 2 minutes more, then add the spices and fry for 1 more minute. If the pan appears to be drying out add a little water rather than more oil. Transfer to the slow-cooker. Add the tomatoes to the slow-cooker plus one empty can filled with water. Mix well then cover and cook on a low setting for 8 hours. Whisk the yogurt in a bowl and add 50 ml of hot water very slowly whisking all the time. This will stop it curdling when you add it to the curry. Add the yogurt, mixing continually, to the curry. Add the garam masala and season with salt to taste. If you want the curry a little hotter add a little more chilli. Cook for a further 30 minutes then serve with boiled rice and, if you like, a side salad. It’s been over two years since I last posted on my blog, partly due to illness. As part of my recovery plan I decided to tackle my health head on and get into peak fitness. Eighteen months later and nearly three stone lighter, thanks to Slimming World, I am just about there. So, today is a new beginning for my blog. I will not be posting as often as before and will only be posting recipes I have made up myself, using the principles of Slimming World. I’ve been dying to try this recipe which has been floating around in my head ever since I first had a seafood pasta dish in a local restaurant. I’ve used all fresh ingredients and the finished dish was delicious, even if I do say so myself. I’m sure some of my Italian friends will be appalled but hope they will forgive me some creative inspiration. 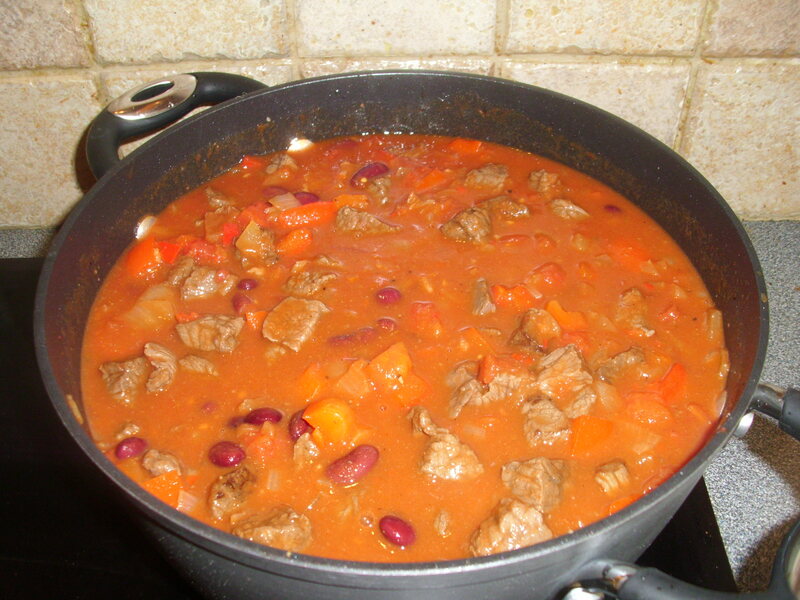 The chilli gives a bit of a kick but doesn’t overpower the dish and can be omitted if you like. Likewise, mix and match the seafood to suit your own personal taste. Cooking is about adventure, having fun and taking a few risks. Go for it, I’m sure it will turn out well but if not there is always the chippy. Spray a large skillet or nonstick frying pan with oil or Frylight. Heat gently then add the onion and garlic. Fry over a medium heat for about 10 minutes until the onion is soft but not coloured. In the meantime cook the pasta in boiling salted water. Add the tomatoes and continue to fry for about 5 minutes until softened then add the wine and cook for a couple of minutes more. Add the prawns and fry for 5 minutes until pink and cooked through. Add the chopped basil, mussels and squid. Season with salt and freshly ground black pepper. Mix gently and cook over a low heat until everything is warmed through. Drain the spaghetti, reserving some of the cooking liquid, and add to the seafood. Toss everything together, adding a little of the reserved cooking liquid if it looks too dry. My inspiration for this recipe was from the menu of one of our favourite restaurants, 15 in Caleta De Fuste in Fuerteventura. There are fifteen main courses on offer, ordered in customer preference. All of the choices are superb but a particular favourite of mine is the sea bass. 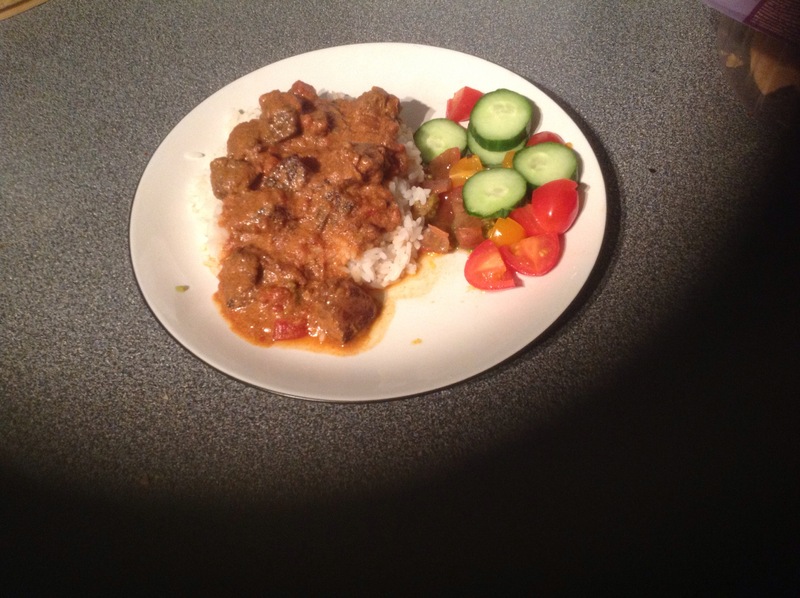 I tried to recreate the lovely flavours in my own recipe and, whilst there were obvious differences, I was very pleased with my results and will definitely be making this again. Preheat the oven to 190c/170c fan/gas 6. Spray some oil into a nonstick frying pan. Add the onion and cook over a low to medium heat for about 10 minutes until soft but not coloured. Add the garlic for the last minute. add the chopped courgette and continue frying gently for 5 minutes. Add the mushrooms and fry for a further 5 minutes. Add the tomatoes and season lightly. Cook for about 3 minutes. Add about 50ml of water and mix well. Continue cooking until all vegetables are tender. In the meantime, wash and dry the sea bass. Place in an oven dish. Score each side with a knife and squeeze over the lemon juice. Season with salt and black pepper and spray with low calorie olive oil. Bake in the oven until cooked through (about 25 to 30 minutes. Mix the creme fraiche, mango chutney and curry paste together, adjusting to suit personal taste. Stir into the ratatouille gradually, a spoonful at a time and mix in until you have a creamy consistency (about 3 tbsp). Adjust seasoning. 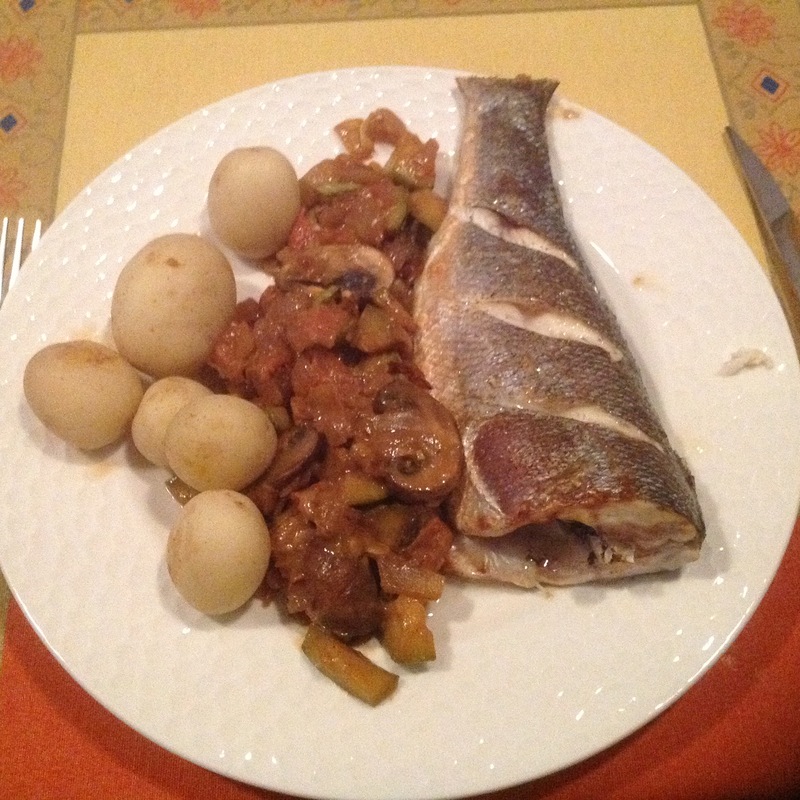 Serve the sea bass with the ratatouille on the side and some boiled new potatoes if you like.